The Public Relations committee is offering three contests for 2016, all with a deadline of October 1, 2016. It’s easy to participate. Let’s take a quick peek at each one. 3 ) Social Media Participation Contest: Create a Buzz about your Grange, its projects, activities and events by managing a proper Facebook or Twitter Page. This contest is open to all Community Granges, Pomona Granges and Junior Granges. Pages must be active at any point within the period of November 1, 2015 - October 1, 2016. All of the details, rules, and information for the contests can be found on the Connecticut State Grange website at www. 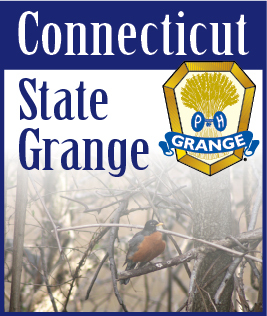 CTStateGrange.org, and will also be available in the Blue Book. Entries should be mailed to Robert Charbonneau, 102 Spring Street, Meriden CT 06451, or sent via e-mail to publicrelations@ctstategrange.org.